Arsenal's Park Chu-young may be heading to the Brazil World Cup after all despite his recent struggles at the English Premier League club, according to national team manager Hong Myung-bo. "I can take Park Chu-young and even Park Ji-sung to the World Cup," Hong said at a press meeting in central Seoul on Wednesday. "It is true that Chu-young has not been able to maintain the best feel of the game because he hasn't been playing (often) for his club. But a player who can act as a psychological leader among the players will help the team greatly, and in my opinion, Chu-young can do that," he added. "This World Cup takes place immediately after the European league season ends, unlike the London Olympics in 2012. This makes it even more difficult for Chu-young to be in his top form when he joins the national team," said Hong. But he was convinced that the "addition of Chu-young to the national team would give it an overall boost thanks to his leadership and experience." Hong hinted at the possibility of creating room for the talented striker by adding his name to one of the reserves. "Although the roster for the World Cup has 23 players, only around 15 to 16 will actually get to play. The others are there to prepare for unexpected situations, and sometimes young players are listed to gain experience." Hong also talked about the possibility of Ji-sung making a return to the national team. The experienced playmaker is still playing a vital role for the Dutch Eredivisie club during his second stint there, but he retired from international duty in 2011. Hong's comments suggest the manager may ask the 2002 World Cup star to tag along in an advisory role or even attempt to persuade him to don the national jersey for the quadrennial summer showcase in South America. "I know that Ji-sung has said several times that he has no intention of playing in the World Cup. But I plan to meet with him privately and talk with him directly about that," he said. Hong hopes to meet him after the team's training camp in the U.S. this month and ask him to consider serving as an anchor for the team in Brazil, he added. The coach will finalize his roster before the team leaves for its final overseas training in May. 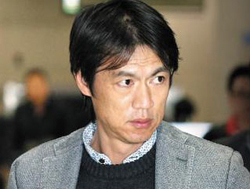 But he will first select 23 players mostly playing in the top domestic Korean and Japanese leagues for winter training. They will head to Brazil next week and train at Foz do Iguaçu -- their base camp during the World Cup -- before moving to the U.S. for the second leg of training. In the U.S., they will play three friendlies with Costa Rica on Jan. 25, Mexico on Jan. 29 in San Antonio, and the U.S. on Feb. 1 in Carson.